Grant a Dream to a DREAMer! With these funds I will...grant a dream to a DREAMer! The fight for immigration reform becomes louder and louder. Bibiana Romero, a current senior at Muchin College Prep, has founded a DREAMers' Club - a safe space for other students like her, undocumented immigrants, to bring the fight to Chicago. While most students can earn a 3.0 GPA and a 22 ACT score in order to earn an adequate combination of federal loans, grants, and scholarships, DREAMers cannot. In order for DREAMers to fund their college education, they have to earn much higher metrics in high school in hopes of earning a partial- or full-ride to college as they are not granted any federal loans whatsoever. Ultimately, DREAMers have to work twice as hard against infinitely more obstacles than their peers to earn a college degree, and thus, a brighter future. It is simply not fair that our undocumented students, who were brought to the United States for a better life (often unknowingly as they were so young when they made the trip) are not allowed the same opportunity as their peers. This is especially true considering that many of them live in single-parent homes and are scraping to make it through the next day as wages for their undocumented parent(s) are incredibly low. 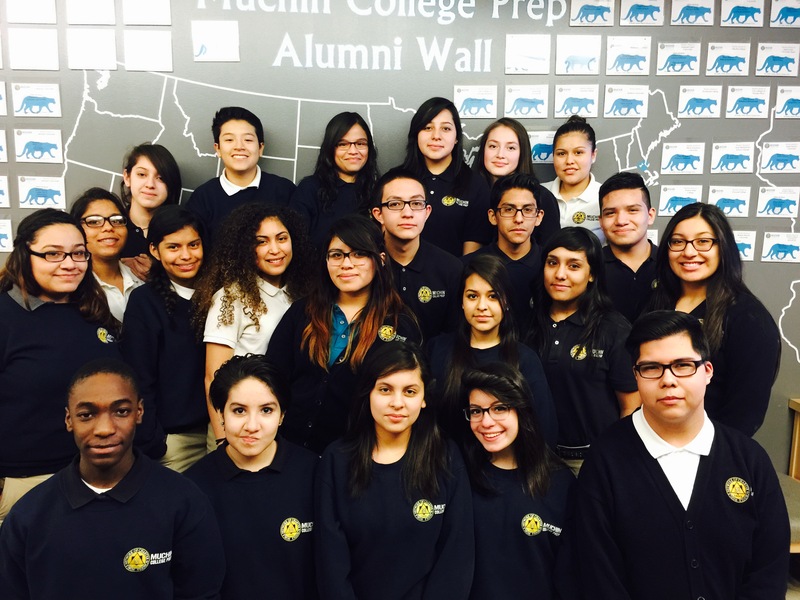 Muchin College Prep is just that - a charter school within Chicago Public Schools that pushes its students with rigorous curricula in attempt to eliminate the achievement gap and provide the city's under-served students equal access to a college education. Bibiana, currently a 4.0 student, has been accepted into 8 colleges. How cruel is it, that after these four years of grueling college preparation, college is not an option for her due to financial reasons. Her only reasonable option at this point is community college, which is disheartening given how high her GPA is. 1) Funding DACA applications ($465 every two years). DACA grants undocumented immigrants a temporary social security number which allows them to work and remain in the United States legally as long as the individual has no criminal record. Being DACA-eligible also allows seniors in high school to apply to significantly more scholarships for college compared to those students who are not DACA-eligible. 2) Funding the college gap through a Muchin DREAMers' Scholarship. Because undocumented students do not qualify for financial aid, college often seems impossible. While the common senior applying to college can get loans to cover the ~$12,000 gap per year to go to college, the undocumented student has to a) find a college that has a much smaller gap (usually a school of lower quality such as a community college), and b) find the cash to cover the gap as he/she is not eligible for federal financial aid. Thank you so much for your help - every dollar spent is a dollar investing in our future generations by funding a DREAMer's college education! If I do not meet my goal...I will still use all of the money raised to contribute to funding DACA applications and DREAMer college scholarships. Thank you to Jess Hartnett! You are incredible, and we are so grateful that you've helped out. See you soon! My people Dan Rigney and Kiley Fister are so generous! Thank you for helping!!!!! Thank you ALEX GONZALEZ. A friend to MCP- joined us for career day, and pitched in to help make Bibi college-bound! Thank you so much for donating Caitlin O'Brien- A true friend making Bibi's DREAM come true! I am a Dean of Instruction at Muchin College Prep, a campus of the Noble Network of Charter Schools in Chicago - go mountain lions! Prior to Muchin, I committed two years to teaching middle school math in St. Louis through a program called Teach For America. I moved to Chicago to help found Muchin and have been there since as a teacher and now as an administrator. We are getting ready to graduate our third class of scholars (most of which are first generation college students), and I could not be more proud of each and every one of them. The most important work that we have today is investing in our future generations. I strongly believe that urban education reform is the civil rights movement of today. I love my scholars and will do anything for them, which is why I am starting a Pledge Cents cause to ensure that all of our scholars, including those who are not citizens, are able to earn a college degree. Embed Grant a Dream to a DREAMer! Follow Grant a Dream to a DREAMer! You will now receive periodic emails regarding the progress of Grant a Dream to a DREAMer!